Bridge Electric’s team brings together many specialists to solve your electrical needs. Their combined technical knowledge and field experience provides a complete offering of electrical services for the entire life cycle of your project including; budgeting, electrical design, construction, and building maintenance. With over 30 years’ experience, Terry brings a wealth of technical knowledge and industry construction experience to the Granby Group of Companies. 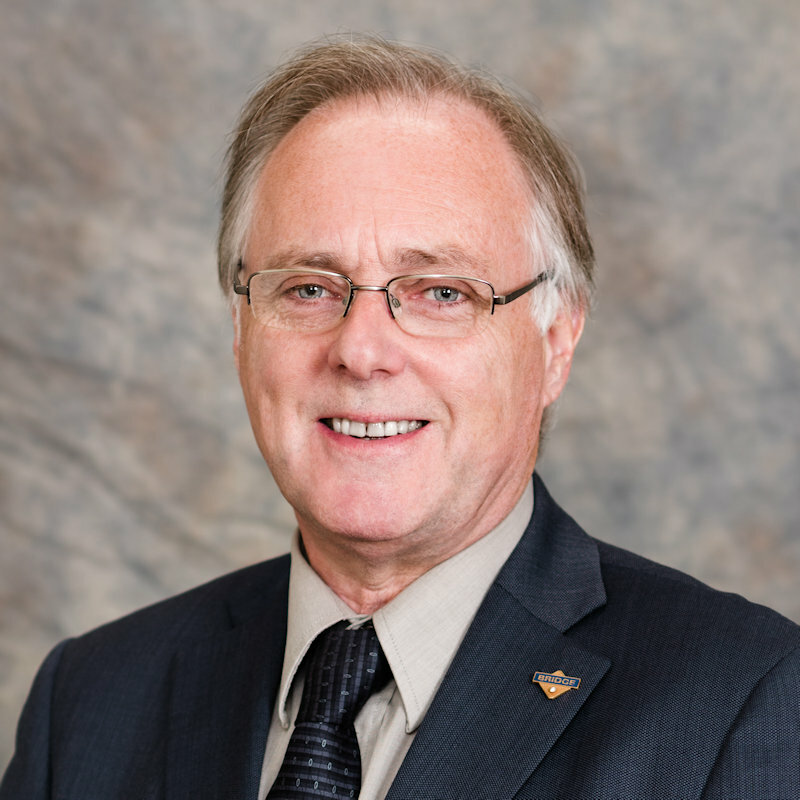 Terry is senior professional electrical engineer and has a Professional Manager designation from the Canadian Institute of Management. As President and C.E.O. of Granby Group, Terry is an integral part of our dedication to quality and cost effective constructability practices. He is responsible for legal and financial matters and provides leadership and guidance to staff in the firm. President - Bridge Electric Corp.
As President, Duane oversees all department managers in the day to day operations of the company. Duane is a journeyman electrician with over 25 years of experience in electrical construction and management. He is also responsible for our corporate safety program and all field personnel, matching electricians ́ individual experience and abilities to specific job requirements. Duane prepares and leads field training seminars to provide workers with the knowledge and resources to fulfill our corporate “on time” project performance philosophy. He actively ensures our high safety standards are met on each project. 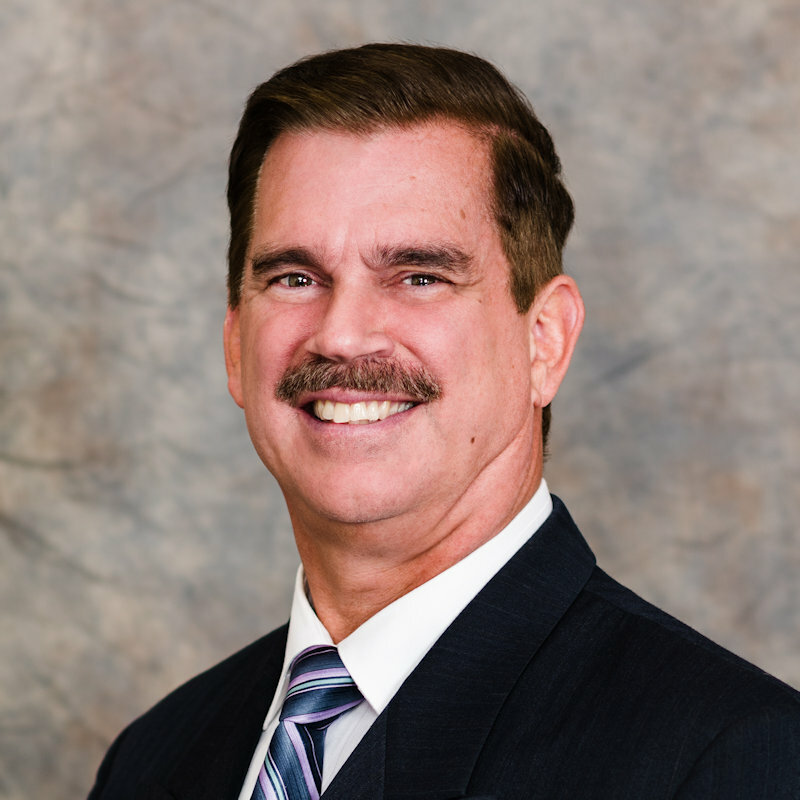 Starting with Bridge since its inception in 1982, Brad currently holds the role of CFO for the Granby Group of Companies. 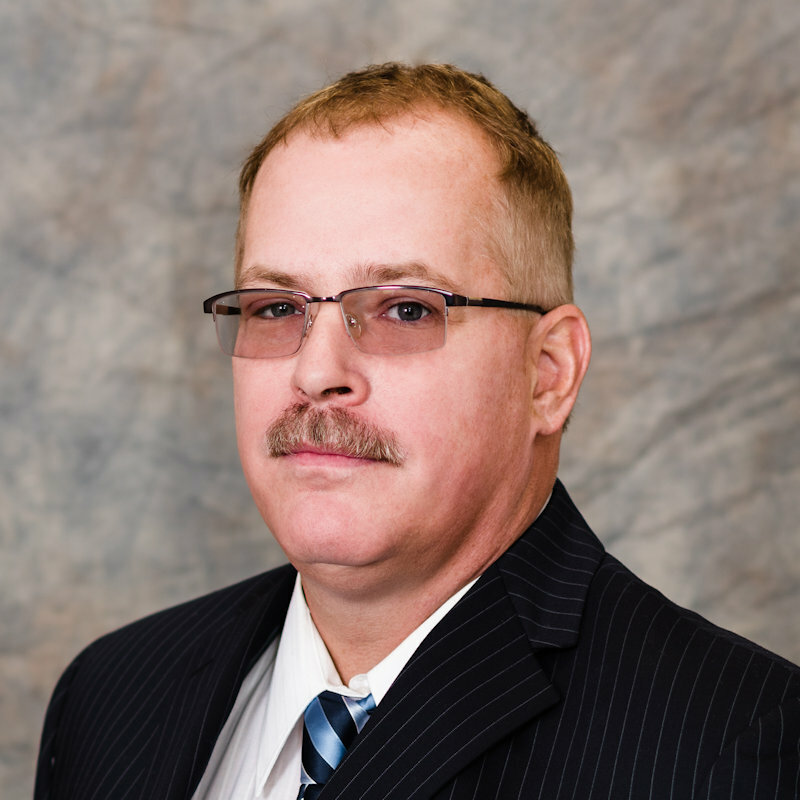 Brad has 20 years of experience as a Certified Professional Accountant (CPA) and holds a journeyman electrical ticket. While Brad’s days of installing conduit and pulling wire may be over, he continues his multi-talented efforts while also overseeing contracts and insurance for the group. 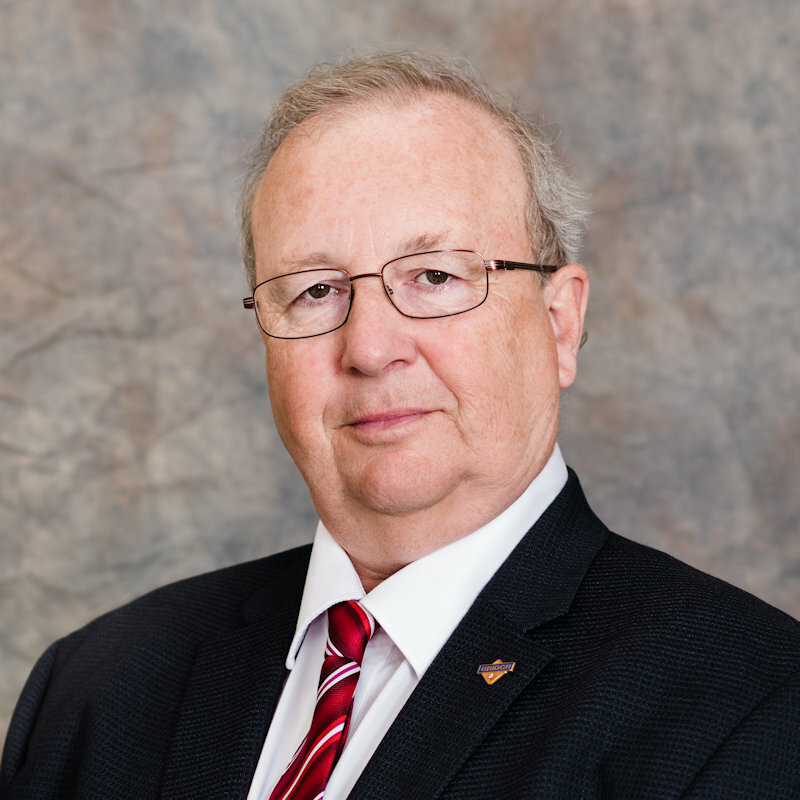 Chief Estimator - Bridge Electric Corp.
Ken has over 40 years of experience in the electrical construction industry as an electrician, foreman, estimator, and Gold Seal certified project manager. As chief estimator, Ken prepares project budgets, evaluates tender opportunities, supervises estimators, prepares quotes, and provides customer support. Ken ́s well-rounded experience and knowledge-base is a significant asset to customers looking for cost-effective solutions to challenging projects. Manager Special Projects - Bridge Electric Corp.
A journeyman electrician with over 35 years of experience in sales, estimating, and project management, Chris manages the day to day operations of the special projects department which includes tenant fit outs and fast track projects. Chris particularly enjoys the challenges associated with fast paced projects and complex renovations. 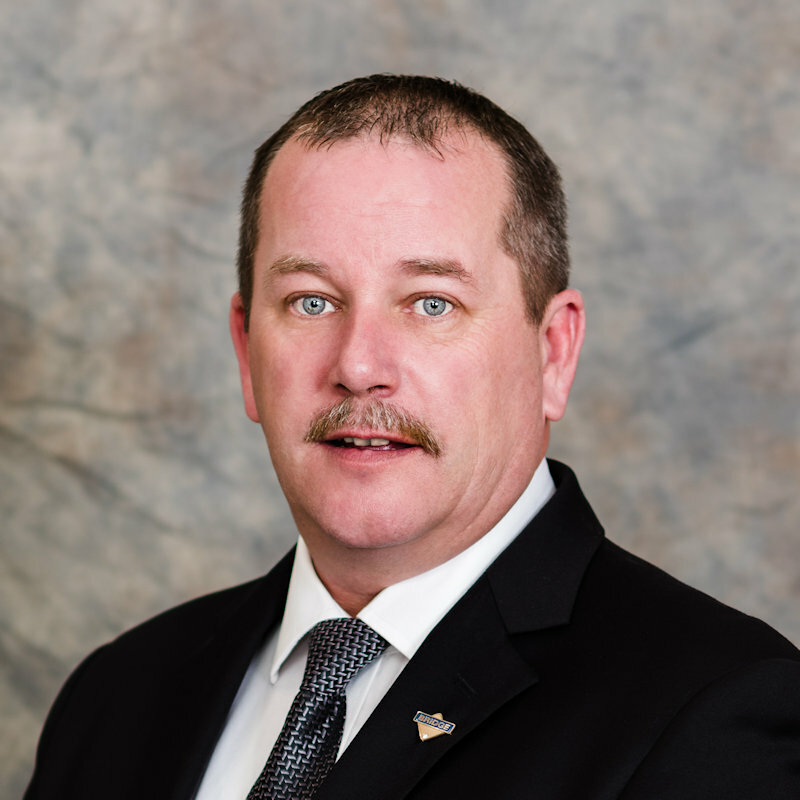 Manager Service Department - Bridge Electric Corp.
Michael has been involved in the electrical construction industry since 1993 and is an interprovincial journeyman electrician as well as a Gold Seal certified project manager. Michael oversees the day to day operations of the Service Department and continues to build and maintain relationships with new and existing customers on design build and design assist projects. Michael excels in constructing difficult, multi-faceted projects that require attention to detail. At Bridge Electric we believe that safety should never be sacrificed for productivity. We invest in this belief, which can be seen in the external COR audits completed by W. Denault & Associates. Together with a people first first mentality, Bridge has received recognition as a top employer in British Columbia. However, these are just some of the elements that make Bridge Electric the company it is. Read more in our corporate brochure or information found on the rest of the website. Learn about Bridge Electric in our 2016 corporate brochure. The brochure covers some of our projects and recent VRCA Awards of Excellence winners. It outlines our safety philosophy and what being part of the Bridge team means to us. It also discusses what our “On Time” is and the efforts we invest to achieve it. 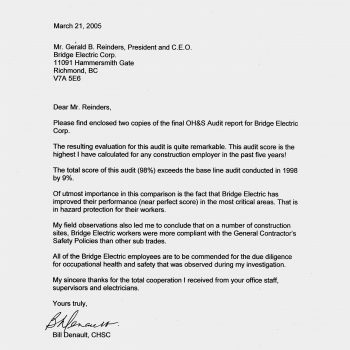 In both 2002 and 2003 Bridge Electric submitted for recognition as one of “Best Companies to Work for in British Columbia”. In both years Bridge was recognized by Watson Wyatt for BC Business Magazine with the 2003 entry earning Bridge the 7th spot in the province. The only company in the construction industry so recognized at the time. Bridge Electric takes safety serious in the work place. We are BCCSA COR certified, a process which involves annual safety audits. Every three years the audit is conducted by an external company, W. Denault & Associates. A small sample of the letters received from W. Denault & Associates over the years. Bridge Electric Corp. was incorporated in Richmond in 1982 to do light commercial and industrial electrical installations. In 1987 Bridge merged with the Granby Group of Companies, under the leadership of Gerald Reinders and Alan Holmgren, to gain access to skills and connections for larger projects. In 1991 Alan Holmgren and John Reinders were appointed to lead Bridge, Alan as President 1991–2005, John as General Superintendent 1991–2012. Brad Goodwin was appointed VP Finance. This executive team rapidly reorganized Bridge to successfully pursue larger commercial projects resulting in rapid growth for Bridge, culminating in Bridge becoming one of the top electrical contractors in British Columbia. Since 1998 Bridge has earned 14 Vancouver Regional Construction Association (VRCA) “Awards for Excellence in Construction” as Bridge demonstrated its unique commitment to “On Time” service with their highly skilled and motivated team of up to 250 electricians. Bridge was recognized among the “Best Companies to Work for in British Columbia” in a survey by Watson Wyatt for BC Business Magazine in both 2002 and 2003, the only company in the construction industry so recognized at the time. The article published in BC Business Magazine in 2003 can be found here. 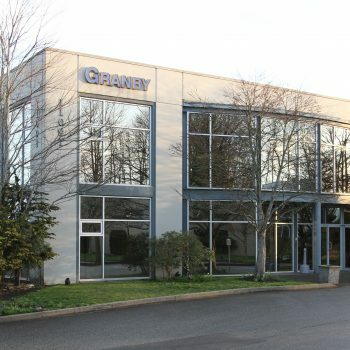 In 2005 Terry Lange succeeded Alan Holmgren as President and in 2012 became President of the Granby Group. 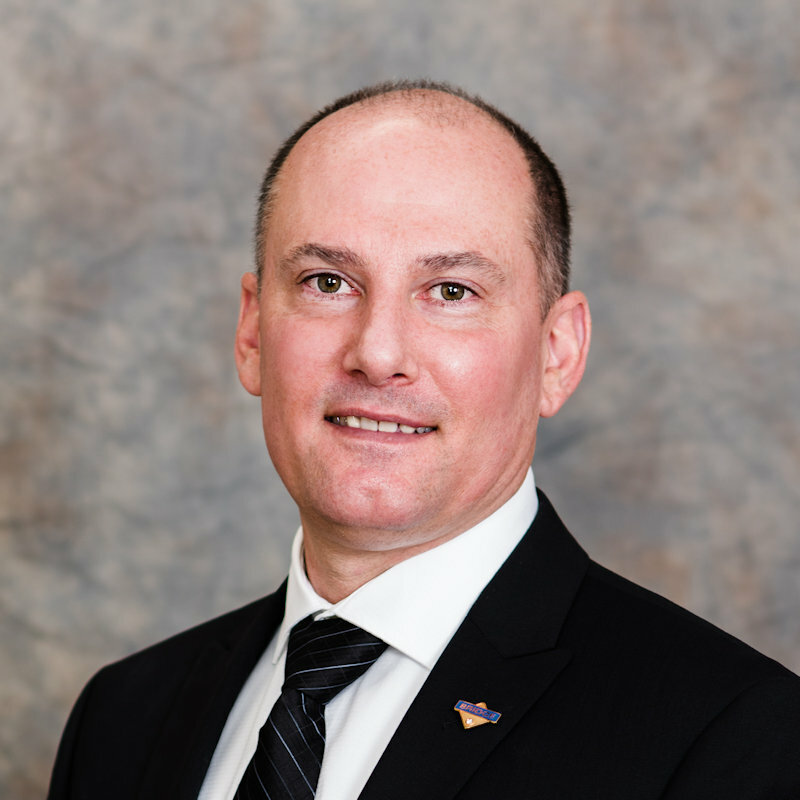 Duane Besse was appointed President of Bridge in 2015 and is leading Bridge with continued success. Bridge Electric believes that partnerships are the key to long term success. As a result they are members of several local organizations; VRCA, ECA BC, ICBA, BCCA, BC CSA, and the BC Hydro Alliance of Energy Professionals.